Furry Vengeance is a live action comedy with computerized animation effects that the entire family will enjoy together. Starring Brendan Fraser as the silly villain, with Brooke Shields, Matt Prokop (High School Musical 3), and Ken Jeong (Pineapple Express) rounding out the cast. In this fictional account, Fraser plays the real estate developer of Rocky Springs, a new housing project. No sooner has destruction of their habitats begun, do the wildlife in the woods rise up in revolt to fight the trespassing two-legged creature's plans. With a raccoon as their leader, as well as a skunk as one of his proteges, along with a host of other forest animals with human characteristics, this movie will certainly entertain young and old. It also drives home the eco-friendly message that we need to protect wild animals and their animal homes, lest we risk their endangerment and eventual extinction. 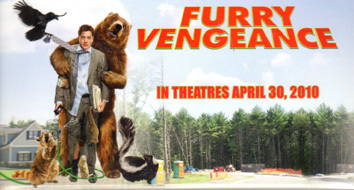 Furry Vengeance from Summit Entertainment opens Friday, April 30, 2010 nationwide. See the trailer, plus get more information on this motion picture and free access to lots more kid-friendly activities on the official site. WIN a Box of Furry Vengeance Mini Cookies like the one pictured at left (2 prizes), or a Furry Vengeance kid's T-shirt (2 prizes) or the official Furry Vengeance wall poster shown at the top of this blogpost (2 prizes). TO ENTER THIS GIVEAWAY: Just leave a comment below this MommyBlogExpert post saying why you think Furry Vengeance will be a hit with kids and parents alike. Be sure to include your email, Twitter, or Facebook contact info with your comment so we can contact the winners. Only legal residents of the U.S. are eligible for this giveaway. HURRY--Contest ends May 3, 2010 at 11:59 pm PST. FTC Disclosure: MommyBlogExpert is giving away the prizes in this contest, which were received from the film's promoters. MommyBlogExpert did not receive any payment or other compensation associated with this post or giveaway contest. See complete FTC Disclosure information that appears at the bottom of MommyBlogExpert's main page and at the bottom of every individual post on this blog, including this one.